You missed the first part of this introduction to GS? No problem, you can find it HERE. Let’s see a more interesting use of the GS: a geometry doubler. This geometry doubler duplicates the input primitives and translates them along the vertex normal. Like in the first example, the GLSL program includes a VS, A GS and a PS. 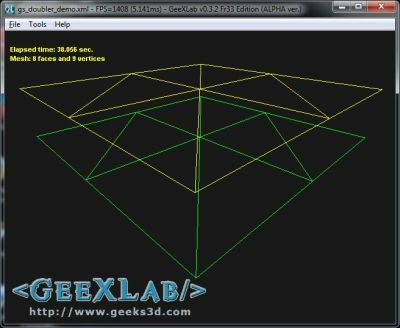 The geometry doubler allows us to see how to pass data from vertex shader to geometry shader. As you can see, this vertex shader is rather mininal (a pass-trought VS). Why? because the vertex transformation will be done in the geometry shader. 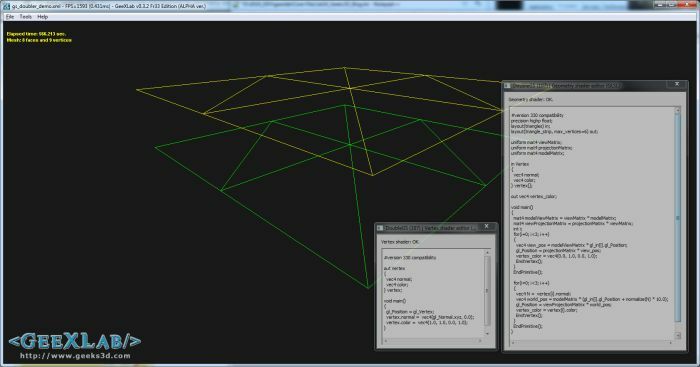 In this vertex shader, normal is a vertex attribute and is sent to the geometry shader like the built-in gl_Position. Now let’s see how to read the vertex normal in the GS. //====== First triangle - identical to the input one. Remember, we are in a geometry shader: that’s why we retrieve per-vertex normals in an array. There is one normal per vertex and the size of the array is… 3 elements because the GS takes a triangle as input data. The number of elements of the array is automatically set by the GLSL compiler according to the input layout (here a triangle). The GS outputs now 6 vertices. Nothing special about the PS. I like a lot your “Simple Introduction” series. It’s well explained. I agree – these simple intros are a useful reference. I get a compilation erorr, when I’m trying to compile this sample. This source is incompatible with 330 version. I do not recommend using compatibility profile. It can lead to problems such as one baron describes.